Heat oven to 300°F. Combine graham cracker crumbs, 1/3 cup sugar, cocoa and butter; press mixture onto bottom and 1/2 to 1 inch up side of 9-inch springform pan. Beat cream cheese and 1/4 cup sugar until fluffy. Gradually beat in sweetened condensed milk, then melted chips, until smooth. Add eggs and vanilla; beat well. Pour over crust. Bake 60 to 70 minutes or until center is almost set. Remove from oven. With knife, loosen cake from side of pan. Cool. Remove side of pan. Garnish with CHOCOLATE DRIZZLE, whipped topping and chocolates. Refrigerate until cold. Store covered in refrigerator. CHOCOLATE DRIZZLE: Melt 2 tablespoons butter over low heat; add 2 tablespoons HERSHEY'S Cocoa and 2 tablespoons water. Cook and stir until slightly thickened. Do not boil. Cool slightly. Gradually add 1 cup powdered sugar and 1/2 teaspoon vanilla extract, beating with whisk until smooth. About 3/4 cup. 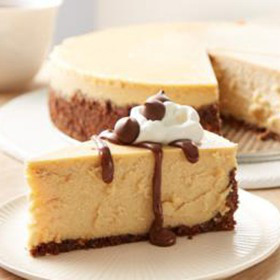 You had me at the word Reese's, but then you said cheesecake!!! eekkk...both of my favorites...I will be making this today...and I may not tell anyone in the house I am making it.